they contact a suitable support, wrapping around the object to support the plant. Download a pdf table of plant hormones. Functional anatomy of the mechanoreceptor cells in tendrils of Bryonia dioica Jacq. Engelberth et al. The tendrils of Passiflora caerulea, D.T. Mac Dougal, Botanical Gazette, 1893, 18: 123-130. Plant signalling: the inexorable rise of auxin. A.J. Fleming, 2006. Trends in Cell Biology 16: 397-402. Mechanisms of control of leaf movements, Satter & Galston, 1981. Ann. Rev. Plant Physiol 32: 83-110. Reaction wood and the regulation of tree form. Sinnott, 1952. Am. J. Bot. 39: 69-78.
neurobiology: an integrated view of plant signaling. Trends in Plant Science 111: 413-419. Gurovich, L. A., 2012. Electrophysiology of Woody Plants, Electrophysiology - From Plants to Heart, Dr.
Plant Physiology. Salisbury and Ross. ring of membrane-bound vesicles or sacs that store calcium ions (calcium store) and beneath this is a cytoskeletal ring. circumference of the bleb is a ring of callose. The following account gives a likely model of the mode of action of these sensors, as suported by experimental evidence. the blep. 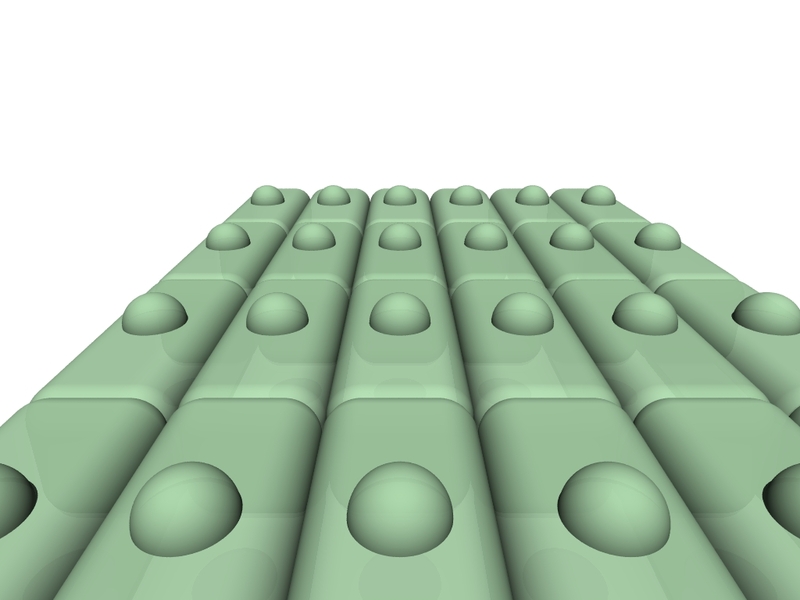 There is a ring of cytoskeletal proteins beneath this calcium-storage region. so help to restore the shape of the blep to its resting state. and some signal may be passed along these (possibly a physical signal, according to tensegrity theory). octadecanoid molecule is known to act as such a signal. grappling a support, these vines are well able to resist wind forces. tendril and this acts as a stimulus for the final development of the swelling which differentiates into an adhesive disc. Tendrils of climbing plants may also coil, once an attachment has been made, pulling the climber closer to its support. 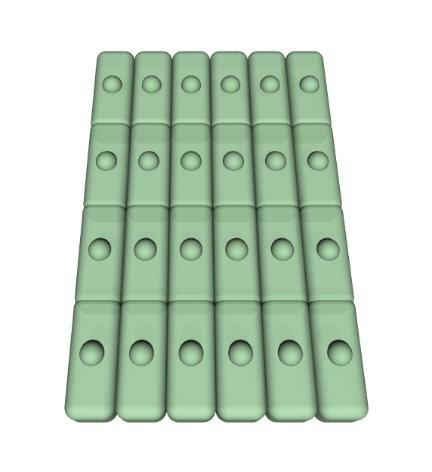 adhesive stick to the surface, but it must also be able to bond with itself so that the adhesive does not fracture. donwards, growing down around obstacles like boulders along the way. 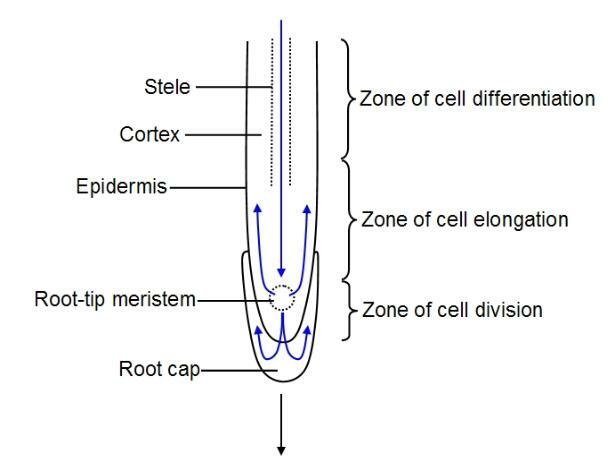 the roots, to the root tip, through the phloem. called action potentials, are used by cells that are some distance apart in the body to communicate rapidly. latter is called a neuroid system, and typically only transmits slowly and over short distances. so the plant nervous system is much slower. Many plants produce action potentials. More-or-less as dramatic as the fly trap is the sensitive plant, Mimosa. they are insects) and if the signal is strong enough it will spread further, causing one or more leaves to droop. applying a flame to a leaf of Aloe vera will generate action potentials. graded potentials in addition to action potentials. pressure following rainfall, an embolism (blockage) in a xylem vessel, bending of the plant, and also wounding. light). Such signals may, for example, signal stomata closure after wounding to conserve water. nighttime activities in plants and may be part of their biological clocks. These are literally 'sleep movements' and are movements related to rhythmic changes in day and night conditions. very sensitive system and a change in temperature of just 0.2 to 1 C can be enough to trigger flower opening/closing. leaf mosaic - a canopy of 'interlocking' leaves. illuminated. This movement, unlike phototropism in shoots and petioles, is not a growth movement and is truly reversible. It is caused by water moving in and out of cells in the pulvinus (the swelling at the base of the petiole which forms a joint). osmosis - see transport in plants). This solar tracking undertaken by leaves is also called heliotropism. pushing force, whilst flexor cells in the cortex on the opposite side of the cortex lose water and become soft and flaccid. and the root grows equally on all sides and remains straight - growing straight down. 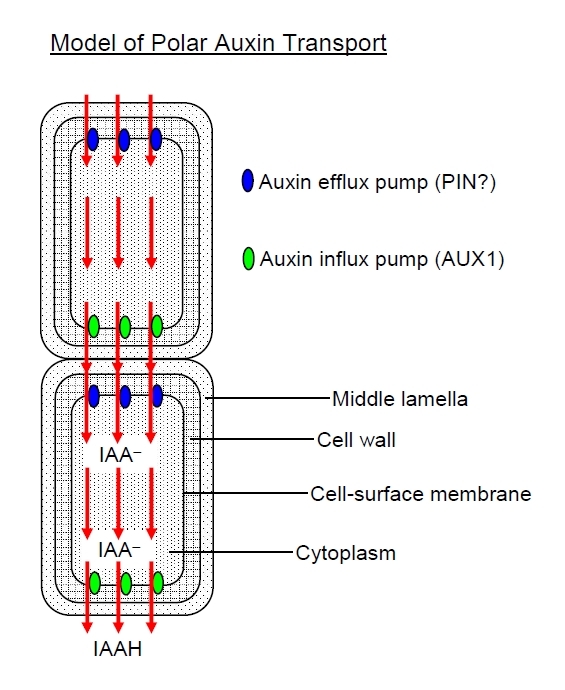 The diagram below illustrates the current model of polar auxin transport. 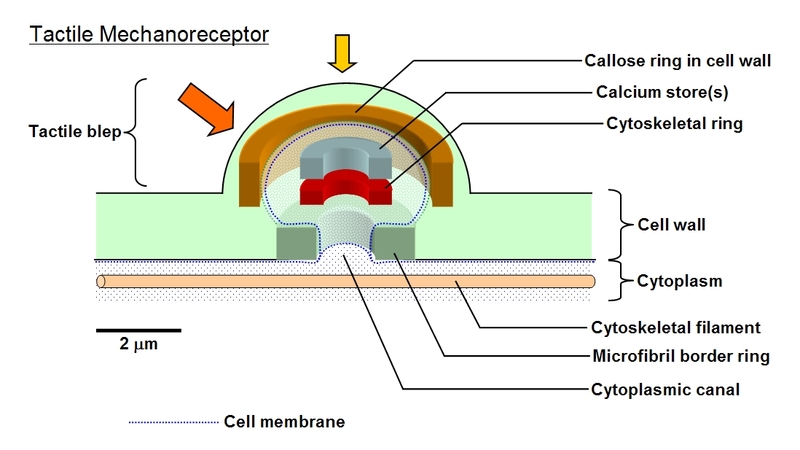 Two neighbouring cells are illustrated. the other end or pole of the cell. 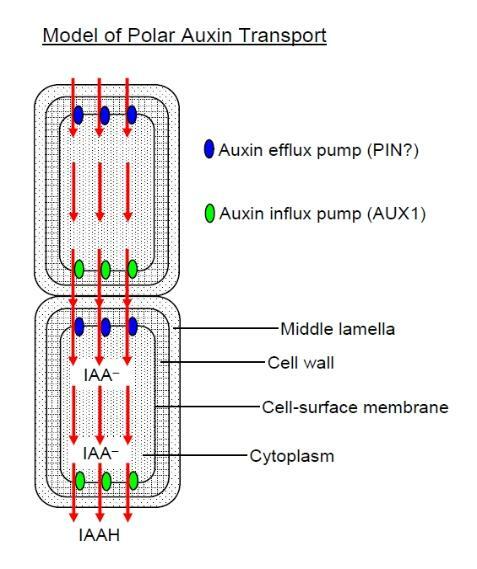 This ensures that the net flow of auxin is from the top to the bottom in the diagram. position against its own weight and also reorient itself should the tree become dislodged and slanted from the vertical. a type of compression wood). against the weight of the branch to achieve the same result. A tropism is a growth away or toward a stimulus. 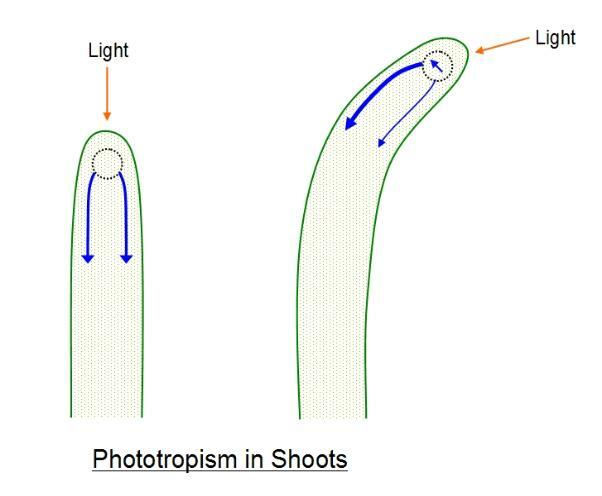 Photropism is growth toward or away from a source of light. phototactic and grow towards the light. region of the shoot just behind the tip) will bend toward the light. 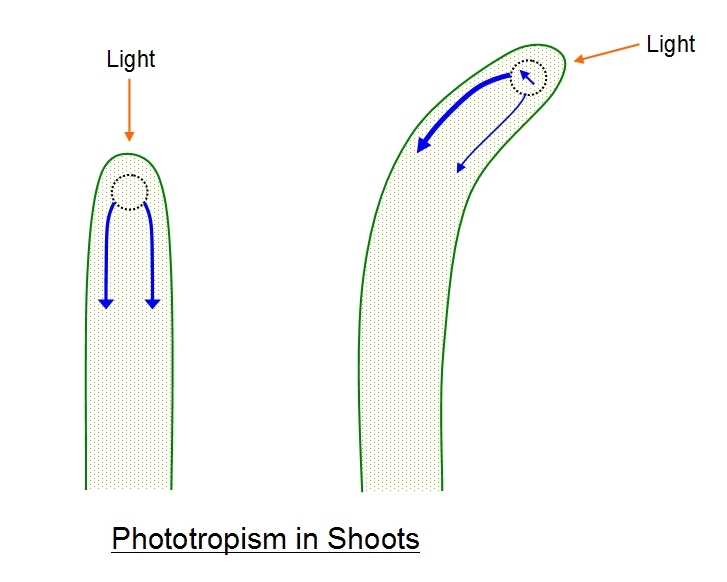 cell elongation) and so cells in the darker side of the shoot elongate more, causing the shoot to bend toward the light. required for polar transport of auxin. growing wider, or because wind-exposed plants are likely to be isolated and so need not compete so much for light. together compete for the light and are sheltered by one-another and so invest in producing a narrower but taller trunk. Coppicing is often carried out - in which the tree is cut done near the base, leaving a tree stump to grow new shoots. together, which allows some nutrients to pass from nearby trees to the stump, or indeed any tree that is struggling. 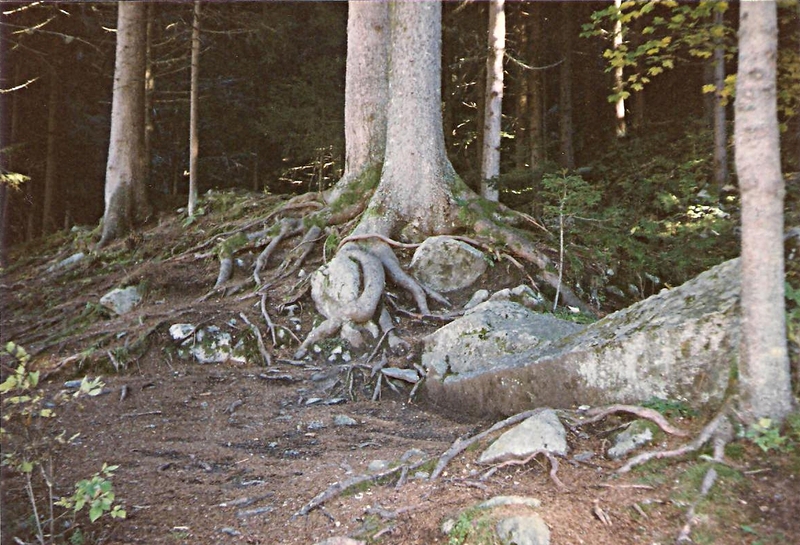 Sometimes such root grafts even occur between trees of different species. taller and thinner, relying on its companions for support may now suddenly be more exposed to high winds. plant growth they must ensure that each group of plants are handled in a similar way. even when kept in 24 hours light or total darkness. 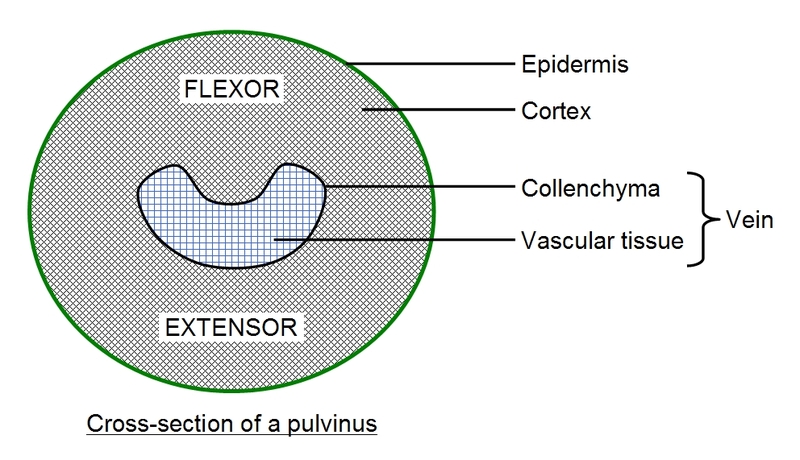 The flexor actively closes leaves, whilst the extensor acts to open the leaves. leaf. Collenchyma cells are supporting cells which have thickened cellulose cell walls. which become inflated, such that the action of the forces is reversed. cause the leaflets of each compound leaf to close, which again involves action of the pulvini. to far-red light at about 730 nm. 13 Jan 2016 - information added on adhesives in climbing plants. reverts back to Pr in the dark. 1. Chlorophyll synthesis (seedlings grown in the dark are pale and NOT green). 2. Leaf expansion (if leaves unfold under the ground it causes problems!). 3. Stem elongation inhibition (dark-grown seedlings have long stems). then turn green, thicken and unfold its leaves. responses (and the role of phytochrome) are incompletely understood. Q. Which form of phytochrome (Pr or Pfr) promotes germination, and which form inhibits it? and so Pr inhibits germination! Seeds that require light for germination are said to be photodormant seeds. (Imbibition: is the first uptake of water by a seed and is required for germination to begin). through the soil. Once through the soil it straightens and the cotyledons unfold). day plants is inhibited by Pfr and stimulated by Pr, since Pr accumulates in darkness and Pfr accumulates in sunlight. predominant phytochrome form in sunlight. for this, germination in shade-tolerant plants is less inhibited by far-red light, than it is in shade-intolerant plants. understood in plants. Clearly much more research is urgently required in these fields of botany / plant science. green shoots and the pulvini of leaves responsible for correct positioning of the growing leaf. network) which is essential for polar auxin transport.